My husband has the misfortune of having a Christmas Eve birthday, making the stretch from the 24th and 25th of December full of gifts, sweets, and events. Wait, maybe misfortune is not quite the right term to use! It is his tradition to get a mint chocolate chip log roll cake from Baskin Robbins every year, and I kept pestering him, telling him I could make something better, and this year he decided to let me have a shot. I'm not sure I met the challenge. There were a few issues with this recipe that made me wish I had done a trial run, but between surgery and other holiday baking I just didn't have a chance! I made the Triple-Chocolate Cake with Chocolate Peppermint Filling from epicurious.com, after an extensive cookbook and internet search for something chocolate minty. The filling is a soft ganache made with milk chocolate, the cake batter has cocoa powder and mini chocolate chips, and the glaze has semisweet/bittersweet chocolate (I used a mixture of both). Now when I count that, I get four chocolates, but maybe that name was taken. My biggest complaint is the cake itself. It could be my fault, but I overcooked it way too much. I think part of the reason is the mini chocolate chips, which increase the cooking temperature of the cake far past a normal cake would cook once it is taken out of the oven. So because the cake was practically crusty on the outside, the gloss was not as smooth as I would have liked (in fact, this first picture shows some of the ganache peeking through). Flavor wise, it was pretty good, but I was too distracted by the dryness of the cake. The filling was possibly the best part, and I also substituted one of the teaspoons of vanilla for peppermint extract in the cake, so it was all quite pepperminty. I'm having a hard time deciding if this was even what I would consider "good" or not. Peppermint is something I enjoy but doesn't really rank in my top dessert flavors (unless we're talking mochas, in which case peppermint is my #1) so I could take or leave this cake. 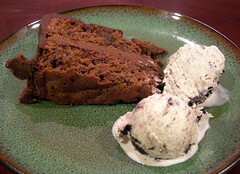 I served this with Ben & Jerry's Mint Chocolate Cookie ice cream, which upped the mint even more. What I am wishing now is that I had tried to replicate the original Baskin Robbins cake, and just make an improved version. I think that was my intent before I started recipe hunting, and then it turned into a completely different animal. 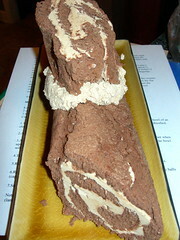 I have wanted to make a Buche de Noel, or yule log cake, for several years now but never got around to it. When it came out as the Daring Bakers Challenge for December, I was excited, to say the least. I knew I had a tree trimming party to go to and planned to make it for that day. The day of the party, it was pouring down rain, the kind of day that makes you want to lock the door, make a pot of tea, and watch movies or read books all day long. I was actually worried it was going to be "one of those days" when I went to the post office to send holiday gifts (the day after the deadline, of course), and then to the grocery store. The only thing I needed was parchment paper, and guess what I forgot? Which meant I was going BACK out in the rain to hunt down parchment paper - which by the way, in my town, neither Walgreens nor CVS deemed important enough to carry - so I didn't get started until around 1 pm. I don't mind having a disastrous baking day (see last month's Daring Bakers Challenge) but was desperate not to have this day be one of them. The first step is baking the genoise layer. I decided to do a chocolate version, and altered the recipe based on Nick Malgieri's suggestions on the old episode of Sara's Secrets (where he bakes this cake!). I watched that episode twice before I delved into this project. I slightly overbaked the cake, knowingly, because it told me to start on the buttercream once the cake was in the oven, but then I had egg whites whisking on the stove when the cake was over and I freaked out a little. So later on, the cake cracked when it rolled up, but it was still all good. I was worried that my buttercream would break after reading some stories of the other Daring Bakers, but I had my fears put to rest by Nick Malgieri, who said once the mixture had cooled completely down in the mixer, you could just throw the softened butter in one stick at a time and beat it until it came together - so I did, and it was wonderfully creamy and SO delicious. This is not the buttercream you make by mixing powdered sugar and butter. I didn't have rum or brandy, so I used Kahlua, which really amped the coffee flavor in this. 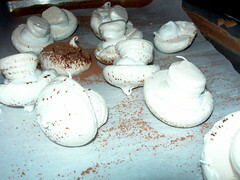 While the rolled cake and buttercream chilled, I went to work making meringue mushrooms. I have made meringue a zillion times -back in my tearoom days we had to have lemon meringue pies every Thursday (and oh look, I even made meringue earlier this month)- but I have never made meringue mushrooms. Lacking a pastry bag, I used a gallon ziploc and it worked pretty well. The mushrooms added the most mystery to the cake - a lot of people at the party thought they were "actual" mushrooms and I had to prove they weren't by cutting them apart. The cocoa powder applied before baking really added a touch of realism. 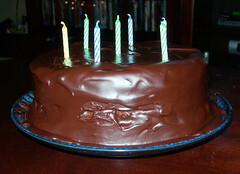 I didn't do much to decorate the cake other than add fork marks (after the pictures were taken, ha!). I was late to the party, it was pouring down rain, and I realized too late that I had no covered dish large enough to transport the cake. So I used the umbrella on the cake and ended up at the front door looking like a drowned rat, but the cake was dry! The recipe can be found on either blog of this month's challenge hosts - Ivonne and Lisa. 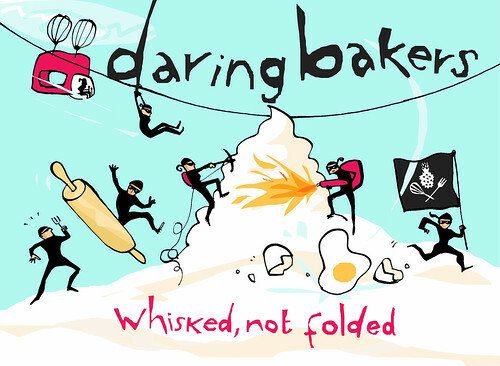 All the Daring Bakers (I believe we're over 300 strong now) can be seen in the list here. I often make baked goods as gifts for the holidays, and this year was no exception. 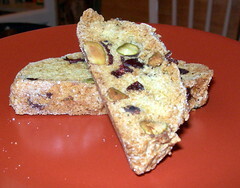 I have been wanting to make biscotti for years but this was the first time I had tried it. I'll do it again, they were so easy. I won't include the recipe, because it is just another one from The Baker's Field Guide to Christmas Cookies, and I've given you enough of those. It's like my cookbook of the month. These biscotti, though, are perfect for the holidays. The red of the cranberry, the slight green of the pistachio.... the dough is fragrant with vanilla and lemon, and they had a lot more flavor than I expected. I originally meant to get some white chocolate to dip the ends in but forgot. Without it they were probably easier to dip in coffee or tea though. For some of my friends, I made little tea gifts with loose tea, disposable/fillable tea bags, and biscotti; a type of relaxation gift. Biscotti have a long shelf life, and would probably ship well, but mine got consumed too quickly to test that theory out. The dough has eggs but no fat, so that plus the baking twice gives them a dry consistency that is perfect for dunking. The second recipe is for the dogs, literally. My husband's stepmother is mother to some basset hounds and foster parent to even more. The Daily Drool is a web site for basset hound owners and fans, and that is the source of this recipe. Bailey, my beagle, can smell these a mile a way and highly recommends them. 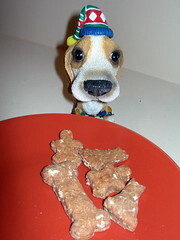 This year I made these for friends with dogs and sent them off, much to Bailey's chagrin. Luckily he received some from Janice so he didn't suffer much! Mix all ingredients, adding more hot water if dough is too sticky. Knead well. Roll out to 1/4 inch and cut into shapes with cookie cutter. Bake on greased cookie sheet at 350 degrees for 40 minutes. Turn off heat and let cool in oven overnight. Jenny's notes: Bailey wanted me to make sure to mention that cat and bone shaped treats are the best. I usually make a half batch of this, which fills one cookie sheet perfectly. These can go bad quickly if not fully dried out, so definitely don't skip the step of leaving them in the oven overnight. Then store them in an airtight container. A lot of the recipes I make during the holidays are family traditions or recent standards - wagon wheel cookies, peanut butter balls, various fudges, and my recently discovered seven layer bars. I am trying to add a few new recipes to the repertoire. This one comes from the book I mentioned last week, A Baker's Field Guide to Christmas Cookies. Can I just say again that I highly recommend this cookbook? I haven't made an unsuccessful recipe from it yet. I really liked these - they capture the flavor (cranberry) of the season as well as a weather reference (meringue), although if you live in South Carolina like I do you have been experiencing weather that is the opposite of snowy - today it got to 77 degrees! So we sometimes have to create a feeling with our baking if nothing else cooperates. 1. Coat an 8-inch square baking pan with nonstick spray. 2. Whisk flour and salt together in a small bowl. 3. In a large bowl with an electric mixer on medium-high speed, beat butter until creamy, about 3 minutes. Add sugar gradually, beating on high speed until light and fluffy. This may take as long as 8 minutes. 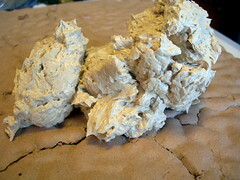 Do not rush; mixture should be almost white in color. Beat in vanilla. Add in 1/3 of the flour and mix on low speed. Gradually add remaining flour, mixing just until blended. Pat crust in an even layer in baking pan. Refrigerate at least 30 minutes or overnight. Wash and dry beaters of mixer. 4. Preheat oven to 350 degrees F. Bake crust until completely dry to touch and a pale golden brown, about 40 minutes. The edges will be a bit darker. Place pan on rack to cool 5 minutes, then spread cranberry sauce evenly over crust using a small offset spatula or back of a spoon. 5. To make topping, whip egg whites until foamy in a medium clean, grease-free bowl with mixer on high speed. Add cream of tartar and whip until soft peaks form. Add sugar gradually, whipping until stiff but not dry peaks form. Beat in vanilla. 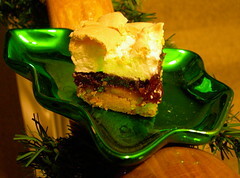 Spread meringue evenly over cranberry layer. Use back of teaspoon to make peaks and swirls in meringue. 6. 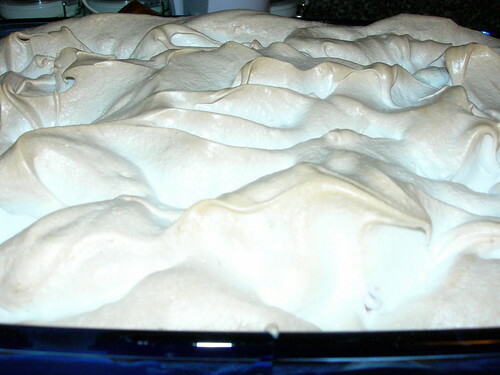 Bake until meringue is a light golden brown, about 25 minutes. Place pan on rack to cool. Cut into 20 bars (4 x 5). Jenny's notes: Definitely let egg whites come to room temperature before beating, and the meringue will go much more easily. I also doubled this recipe. Why do all the work and only have an 8x8 pan to show for it, when you can use up the entire can of cranberry sauce that way? I have this great cookbook called A Baker's Field Guide to Christmas Cookies, and I pick a few recipes out of it to try every year. I've been eyeing the "Yuletide Mocha Orange Patchwork, Pinwheel, and Marbled Cookies" recipe for several years and decided to try it for the first holiday cookies of the 2007 season. This recipe could be replicated with any combination of flavored, firm sugar cookie dough. This time around in the recipe the orange dough was crumbly - I may have miscounted the flour when I measured, because the mocha dough was perfection. If you are going to mix up sugar cookies, you might as well make two batches! 1. For orange dough, whisk flour, baking soda, and salt together in a small bowl. In a large bowl with an electric mixer, beat butter until creamy, about 2 minutes. Add sugar gradually, beating until light and fluffy, about 3 minutes; beat in orange zest and vanilla. Beat in egg. Add about one-third of flour mixture and mix on low speed. Gradually add remaining flour, mixing until just blended. Scrape dough onto large piece of plastic wrap. Use wrap to help shape into a large, flat disc, then cover completely with wrap. Refrigerate until firm enough to roll out, at least 2 hours or overnight. 2. For mocha dough, whisk flour, cocoa, baking soda, and salt together in a small bowl. In a large bowl with an electric mixer on medium-high speed, beat butter until creamy, about 2 minutes. Add sugar gradually, beating until light and fluffy, about 3 minutes. Dissolve instant espresso into vanilla, then beat into dough. Beat in egg. Add about one-third of the flour mixture and mix on low speed. Gradually add remaining flour, mixing until just blended. Scrape dough onto large piece of plastic wrap. Use wrap to help shape into a large, flat disc, then cover completely with wrap. Refrigerate until firm enough to roll out, at least 2 hours or overnight. 3. Line 2 cookie sheets with parchment paper. 4. For patchwork cookies: Choose two compatible cookie cutters, large and small, such as a large and small star or bell or a large gingerbread person and a small heart. The only absolute is that the small cookie cutter must fit within the larger one with a border of dough all around. Roll both doughs out to 1/4-inch thickness on lightly floured surface. I will use stars as our example: Cut out a large orange star and place on cookie sheet. Cut out a large mocha star and place 2 inches away on the same sheet. Now cut out a small star out of the larger orange star and a small mocha star out of the large mocha star. Place small mocha star inside larger orange star (in void created by removing small orange star) and vice versa. Be as creative as you like, but keep similarly sized cookies on same sheet for even baking times. When pan is filled with cookies, place in freezer for 15 minutes or refrigerator for 30 minutes. Cut each flavored dough in half. Roll half of orange dough out to 1/4-inch thickness on lightly floured surface to a rectangle about 14x16 inches. 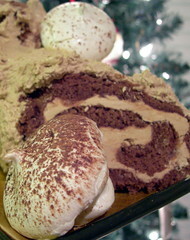 Roll half of mocha dough out in the same manner. 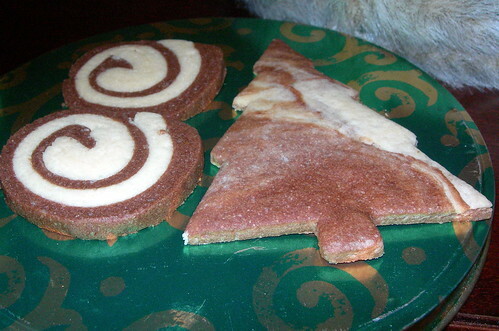 Place orange dough on top of mocha dough and square off the four sides by trimming with a pizza cutter or sharp knife. Starting at one short end, roll both doughs up together as tightly as possible. Your roll should be about 2 inches in diameter. Carefully cover rolled dough with plastic wrap. Repeat with remaining dough halves. Freeze 30 minutes or refrigerate for 1 hour, until very firm. (Rolls may be frozen at this point for up to 1 month). Trim ends of roll so that spiral design is flat. Cut 1/4-inch-thick slices off roll and place 2 inches apart on cookie sheets. Briefly knead all the scraps left from both flavors of dough together to create a marbled effect, roll out as described above, and cut out cookies as you wish; they will look marbled. 5. Preheat oven to 350 degrees F. Bake until dry to touch and edges are just beginning to color, about 12 minutes for cookies 2 inches across. Lift up a cookie; it should lift without breaking, and bottom will be slightly colored. Adjust baking time up or down accordingly if cookies are much smaller or larger. 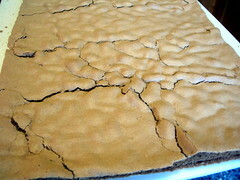 Slide parchment onto racks to cool cookies completely.